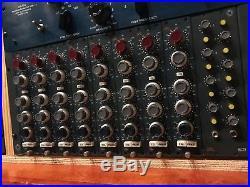 Classic Neve sound at a great price. Comes with rack and power supply. Rack has individual 48V phantom power and rotary fader for each channel. Used in a non smoking studio for approximately 4 years. The BAE 1084 is as authentic as you can get to the original, featuring the same St Ives (Carnhill) transformers as the vintage modules, Elma switches and Canford wire. 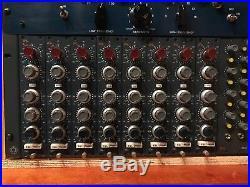 The BAE 1084 looks identical to the original vintage module and will happily retrofit in vintage Neve 80 Series consoles because the entire product is engineered in exactly the same way as the originals: the same chassis construction, connectors, printed circuit board layouts, hand-wired looms, and circuitry. High Frequency: +/-16dB shelving with selectable frequencies of 10kHz, 12kHz and 16kHz. Low Frequency: +/-16dB shelving with selectable frequencies of 35Hz, 60Hz, 110Hz & 220Hz. Mid Range: +/-12dB or +/-18dB peaking with switchable'High Q', selectable centre frequencies of 0.36kHz, 0.7kHz, 1.6kHz, 3.2kHz, 4.8kHz & 7.2kHz. High Pass Filter: 18dB per octave slope, switchable between 45Hz, 70Hz, 160Hz & 360Hz. EQ Button: Switches the equaliser on or off. This is an 8-module self-powered rack for vintage Neve 10-series 8 3/4 high modules including the 1066, 1073, 1084 and our reproduction 1073 and 1084 modules. Each module has its own separate output level control and lighted 48v phantom power switch. The back panel has XLR connectors for mic input, line input and output. The oversize external power supply puts out two times the current necessary to power the rack. It has an extra DC outlet which will operate any of our 1272 preamps or Class A Mixers. 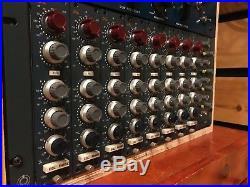 The item "8 BAE 1084 Vertical module NEVE 1084 CLONE with rack and power supply" is in sale since Monday, February 19, 2018. This item is in the category "Musical Instruments & Gear\Pro Audio Equipment\Preamps & Channel Strips". The seller is "rodgerjollie" and is located in Brooklyn, New York. This item can be shipped to United States.